The Sunshine House is a treasured retreat in a grand oceanfront setting. The property consists of a Main Lodge and four private, bedroom cottages connected by short wooded path or by the properties seaside, deck system. 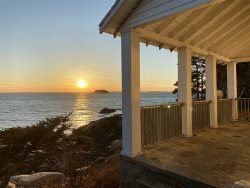 The property has a three ocean access points- one is a large, sandy beach, one is a sloping ledge down to the deep water ocean access, and the third is a more rugged clam cove. The Sunshine House has a deep water dock and panoramic views on 20 acres of glorious land. The Sunshine House is very thoughtfully maintained and cherished by many of its guests, whom seem to find their selves enjoying the property year after year. The Sunshine House is comprised of a main lodge which houses a comfortable seating area with two large couches, a couple of deep bottomed wicker chairs and a HDTV with a DVD player and Direct TV in place. The main house has a kitchen and dining area which is suitable for nine people. The main lodge also has a full bathroom and a great wrap-around deck overlooking Jericho Bay. The deck is comfortably decorated with Adirondack chairs and other seating. The property has four small cottages closely nestled around the deck and path systems. The first cottage has a queen bed, double dressers, a woodstove, and lovely views of the ocean from the comfort of the bed. The next has a king bed, a dresser, and closet. The next two cottages are down the path and close together with a second full bathroom attached. Both of these cottages have queen beds. woodstoves. dressers. and closets. The Sunshine House is a great setting for families or friends to reconnect. Enjoy being together in this oceanfront paradise while also maintaining privacy and individual space. Whether you are ocean faring or relaxing this property allows for its guests to enjoy all the glorious benefits of our lovely island without even having to leave the comfort of your vacation destination.